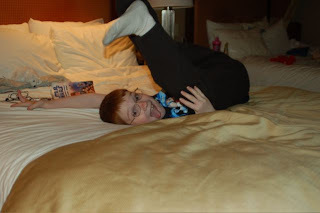 N took this picture of C on our trip, and it cracks me up. They are such silly boys! Our trip was good. I wouldn't say it was relaxing because it's actually more tiring doing all that is necessary for 3 kids when in a hotel . . .but it was a nice time away. We stayed at the Bellagio, which was beautiful. There are a variety of un-bloggable things going on, so I'm trying to figure out how to get started again while continuing to filter that which needs to be filtered. Hmmm, that sounds cryptic, doesn't it? I don't mean to be cryptic, it's just that recently there seem to be lots of things happening that I won't blog about. I have pictures to go through and post, work to catch up on, work to look for, a house to clean, and a variety of other things to do this week. Right now, I need to get ready for church, but I wanted to throw up a quick post letting all know that I'm still around and will get back to regular blogging soon!